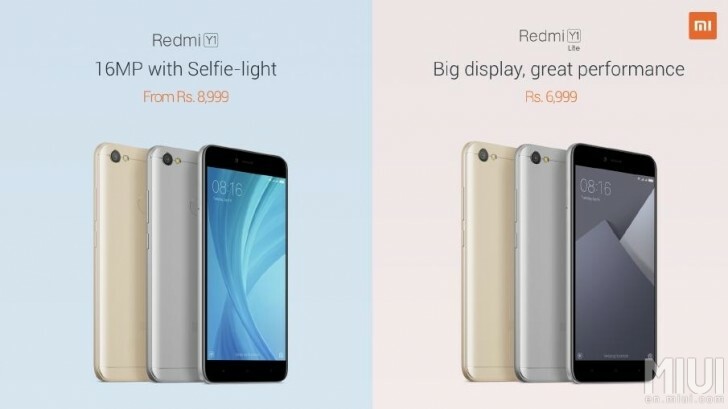 Xiaomi Redmi Y1 and Redmi Y1 Lite have launched today in India. It is the first self-focused smartphone which targets the youth of the nation who are sick of taking selfies. The Xiaomi has now come up with company’s new self-focussed series. The extensive highlight of Xiaomi Redmi Y 1 is the 16-megapixel front camera which is completing the look with LED selfie light. Along with this, the Xiaomi has also announced MIUI 9 Global ROM for the Redmi Note 4, Mi Max 2 and Mi MIX 2 smartphones which get to end of the month. The Xiaomi Redmi Y1 will cost up to Rs. 8,999 in India with a storage of 32GB and 3GB Ram. The company has also released this phone in some different variants with 4GB RAM and 64GB storage which will cost up to Rs. 10,999. While the another Redmi Y1 Lite phone with the variant of 2GB RAM and 16GB internal storage priced at Rs. 6,999. The consumer can book this new Xiaomi Redmi Y1 and Redmi Y1 Lite through the Amazon India as soon the phone will be going on sale via Amazon and Mi.com on 8th November. The new Xiaomi Redmi Y1 has the 16-megapixel front camera with LED selfie-light for the better selfies in low light conditions. And it has also 3.0 beautifying feature. It also has the fingerprint sensor on the rear panel. And the company has launched it in two colors such as Gold and Dark Grey. Both handsets will be available in the market after 8th November.